Most cute baby pictures prompt a smile. And then there is the baby picture that causes Juana Fernandez to cringe. Today, though, the San Fernando Valley mother of three sees nothing cute about it. Learning how to babyproof a home is just one of the many benefits of Welcome Baby, a free and voluntary program from First 5 LA that provides Los Angeles County pregnant women and new families with information, support and a trusted parent coach to help them through the journey of pregnancy and early parenthood. By partnering with local home visiting programs serving the 14 Best Start Communities, Welcome Baby is offered to all women residing in Los Angeles County regardless of risk factors or socioeconomic status who give birth at one of the program’s participating hospitals. Among the program’s key offerings: an in-hospital visit that helps new moms with breastfeeding and supports bonding; a personal Parent Coach who meets with families in the comfort of their home; an in-home appointment with a nurse shortly after delivering; referrals to additional resources; baby-and mom-friendly items; and important information on the health and development of their baby. Mothers who need more focused support and live in a Best Start Community are eligible for Select Home Visiting (SHV) program services funded through First 5 LA. In the 2016–17 fiscal year, 918 families were served by First 5 LA’s SHV program. Just as kids grow, so has Welcome Baby. Since the first pilot program began in 2009, Welcome Baby has expanded to 14 L.A. County hospitals. Now new data reveals that Welcome Baby enrollment jumped 19 percent between fiscal years 2015–16 (11,429 families served) and 2016–17 (13,607 families served) — a significant climb towards the program’s full capacity, when an estimated one in four babies born in L.A. County will be a Welcome Baby infant. 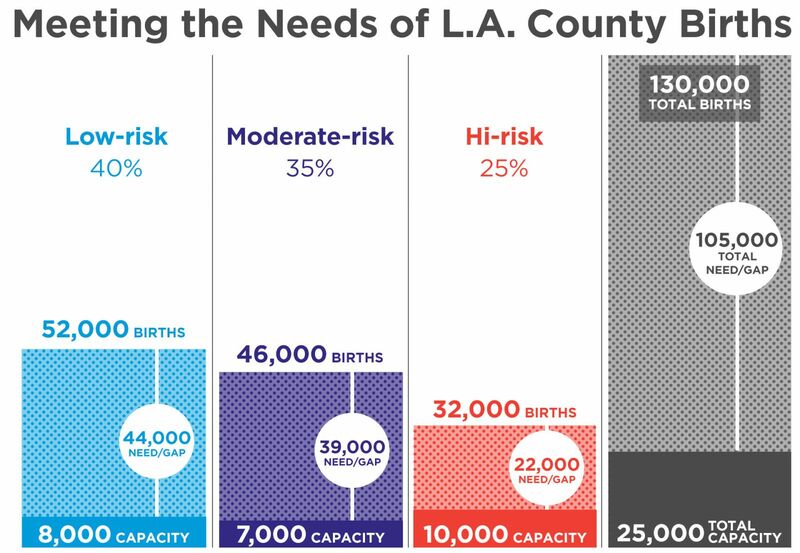 And while First 5 LA is but one of a number of home visiting providers in the county, the need for home visiting in the county far outstrips the current capacity to provide it (see chart on right). Recognizing these challenges, First 5 LA is working on a number of fronts with local home visiting providers, advocates, funders, county government, elected officials and other partners who share the vision that all L.A. County families have access to quality, evidence-based home visiting services. These efforts range from policy and systems change at the state and federal levels to collaborative partnerships to enhance home visiting at the county level. “That is a big bold vision. 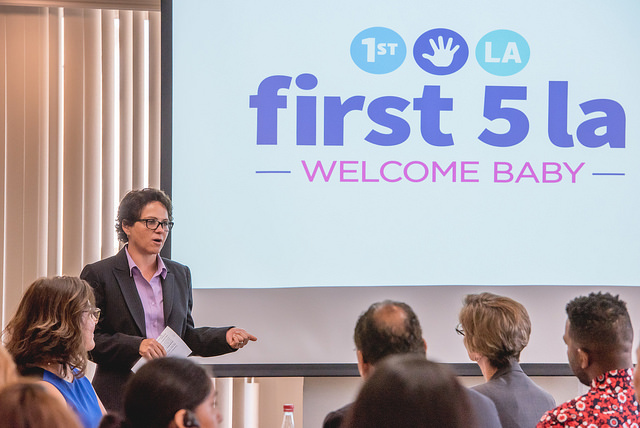 That motivates us all,” First 5 LA Executive Director Kim Belshé said at an August 4 event touting three Welcome Baby programs at Valley Presbyterian Hospital, Providence Holy Cross and Northridge Hospital Medical Center, which hosted the event. While acknowledging that making the vision into reality “is hard, hard work” that is “going to take time and effort,” Belshé expressed First 5 LA’s confidence that, in collaboration with others, “we’re going to get the job done” for two reasons. First, she cited the leadership from parents, family serving organizations, and providers who bring strong voices and a tremendous amount of power to advocate on behalf of all families in LA County before local and state elected officials and decision-makers. Indeed, new research continues to emerge promoting the positive impact of home visiting, most notably from Nobel Prize winner James J. Heckman. This evidence joins a plethora of studies and statistics supporting home visiting’s benefits. First 5 LA Commissioner Romalis Taylor, the former chair of the Best Start Compton/East Compton leadership group, recognized the importance of having Welcome Baby available in his community and echoed the Board’s support for home visiting. Hear his comments in this video. A champion of home visiting in the county is First 5 LA Board Chair and County Supervisor Sheila Kuehl, who in December 2016 authored a motion with Supervisor Janice Hahn that directed the Los Angeles County Department of Public Health (DPH) to collaborate with First 5 LA and other county partners to develop a plan “to coordinate, enhance, expand and advocate for high quality home visiting programs.” This includes identifying strategies to maximize resources by leveraging existing and new funding. 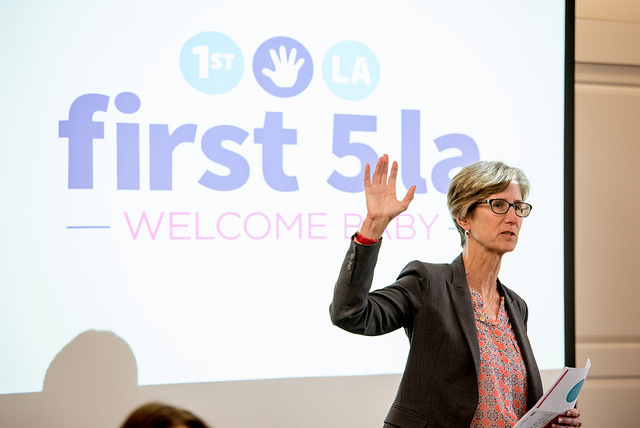 With financial support from First 5 LA, for example, DPSS is committing to developing a pilot project in SPA 6 to refer participants receiving social services with children prenatal to 3 to home visiting supports. The pilot project, which is intended for families at high risk of involvement with the child welfare system, is expected to start by the end of December. During a September 14 First 5 LA Board presentation, First 5 LA Alternate Commissioner Linda Aragon, who serves as Director for the Los Angeles County Division of Maternal, Child, and Adolescent Health at DPH, expressed enthusiasm over the level of collaboration between First 5 LA and the county departments on the home visiting motion planning effort. So far, the effort has produced a common vision and guiding principles, with other developments and next steps highlighted in a June report to the L.A. County Board of Supervisors. Among the partners in the county’s home visiting motion is The Los Angeles County Perinatal and Early Childhood Home Visitation Consortium (LACPECHVC, or the Consortium), which is co-funded by First 5 LA. Founded in 2012, the Consortium is a network of approximately 50 perinatal and early childhood home visitation programs, maternal and child health organizations, advocacy groups and stakeholders. Among the Consortium’s recent accomplishments, Ferrari said, are a new resource directory for direct service providers; a set of outcome measures across all of the home visiting programs that will support financing strategies and a subsequent pilot to collect that data; best practice recommendations to support quality standards across home visiting programs in the county; and a home visiting webinar in June for agencies, nonprofits, government and philanthropists. Key to this approach for future funding, support and sustainability of home visiting are First 5 LA’s policy and advocacy efforts, which were prioritized under the 2015–2020 Strategic Plan to support the agency’s new systems and policy change focus in order to maximize outcomes for a greater number of children and their families in L.A. County. On the national stage, First 5 LA is involved in a tense drama that is expected to come to a close this week over funding for biggest federal player in home visiting, the Maternal, Infant, and Early Childhood Home Visiting Program (MIECHV). Through federal grants from the MIECHV program, home visitors in California provided 31,007 voluntary home visits in Fiscal Year 2016 to 3,561 families statewide consisting of at-risk pregnant women and parents with young children. This included culturally appropriate, individually tailored supports to families in their homes, such as providing information about children’s health, development and safety and, when appropriate, referrals to support services. But federal funding for the $1.5 billion program — which was originally funded in 2010 by the Affordable Care Act and extended twice since — is slated to expire at the end of the month without reauthorization of MIECHV by Congress. As part of its communications strategy, First 5 LA is also using Facebook and Twitter to deliver the message that we proudly join fellow child advocates to urge Congress to support MIECHV. Word of mouth, too, goes a long way to support home visiting. For her part, Fernandez could not place a dollar value on Welcome Baby, except to say what it brings her: peace of mind.